A mostly happy night for the prospects of the New York Rangers and New York Islanders as several of them stepped up their efforts on Saturday night to help their team earn badly needed points. In all we saw players who haven't stepped up their games do so at the right moments. If you thought Adam Tambellini (NYR 2013 3rd) had a solid January when he was 4-9-13 in 10 games after joining the Calgary Hitmen then check out the sequel he is playing with February. So far in just 8 games, Tambellini is 8-2-10 in just 8 games after Tambellini recorded his first WHL hat trick to help Calgary spank the Lethbridge Hurricanes 8-1. It was Calgary's 6th straight win and pulled them into a tie for first place in the WHL's Eastern Conference. It is no coincidence that 8 goals in his last 6 games have been a big part of why Calgary has caught up to the Edmonton Oil Kings. Tambo as many Calgary fans have taken to call him got his evening going when he scored an even strength goal at the 18:00 mark of the first period to give Calgary a 3-0 lead. It was Tambellini's 10th goal since joining Calgary. In the 3rd period, Tambellini did what he is fast becoming known for which is scoring power play goals as he scored first at the 58 second mark to make it 7-0 and finally he repeated the act with his hat trick goal at 10:03. 18 games a 12-11-23 stat which includes 8 power play goals (7 of them this month) as Tambellini is looking like a genius for leaving college. Victor Crus Rydberg's (NYI 2013 5th)8th goal of the season was the overtime game winning goal as Crus Rydberg's goal just 11 seconds into the overtime period gave the Whalers a 2-1 over the Kitchener Rangers. It was his first overtime goal and just his 3rd game winning goal for the young forward from Tingsryd, Sweden. This was the best of timing for Crus Rydberg as the Rangers and Whalers are fighting for the 8th spot in the OHL's Western Conference. Thanks to Crus Rydberg, the Whalers now own a 5 point lead instead of just a 3 point one. Crus Rydberg is 8-21-29. Mackenzie Skapski (NYR 2013 6th) stopped 28 out of 30 shots from Ryan Pulock's (NYI 2013 1st) Brandon Wheat Kings as Skapski's Kootenay Ice earned a 5-2 win. Skapski was handed a 4-1 first period lead and he ran with it to win his 23rd game of the season. Skapski is 23-14-2-1 as he has gone 13-3 since January 1 while lowering his goals against to 2.69 and his save percentage stayed at 0.919. As for Pulock, he scored Brandon's first goal of the game for his 17th goal of the season but he is not getting any real help from his teammates. In the meantime, Kootenay remained 5 points behind the Medicine Hat Tigers for the 4th seed in the WHL's Eastern Conference standings. Brandon saw their winless streak extend to 5 games as they fell behind division leads Regina by 2 points and 6th place Swift Current by also 2 points. Number 2 Minnesota sent a message to the rest of the Big Ten Conference by completing a sweep of number 11 Michigan 4-1 Saturday night. The message is simple, anyone wanting the Big Ten title will need to go through them. It was a very workmanlike effort from Minnesota as they spotted Michigan a 1-0 lead off a goal that Cristoval Nieves (NYR 2012 2nd) had the secondary assist on. Stephon Williams (NYI 2013 4th) earned his first shutout win of the season as his Minnesota Mavericks defeated the Alabama-Huntsville Chargers 4-0. Williams last win was back in December against these same Chargers only faced 10 total shots in the win. Williams is 5-6-0 with a 3.23 goals against and a 0.862 save percentage. It was Troy Donnay's (NYR 2013 UFA) turn to be the game's 3rd star as his Erie Otters defeated the Niagara IceDogs 3-2. Donnay had a secondary assist on the Erie's first goal of the game. Steven Fogarty (NYR 2011 3rd) had the primary assist on an empty net goal as Fogarty's Notre Dame Fighting Irish shut out the Providence Friars 3-0. It was Fogarty's first point in 7 games as he is just 3-4-7 on the season. Jesse Graham (NYI 2012 6th) was scoreless but had a +2 as his Saginaw Spirit lost to the Guelph Storm 6-4. Ryan Graves (NYR 2012 4th) was scoreless on 4 shots but was credited for 1 hit as his Val-d' Ors Foreurs defeated the Shawinigan Cataractes 5-2. 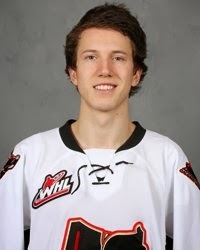 Kyle Burroughs (NYI 2011 7th) had a secondary assist as the Swift Current Broncos defeated Burrough's 3-2 in overtime. Jess, anything on the Minnesota Michigan game? Sorry I was so tired last night I just totally spaced it and this was a game I had taped to watch.